We should never lose sight of our objectives, especially with regard to health. Our body, despite what we can think, never takes a vacation, and we can not afford to fall into a sedentary lifestyle. For this reason, it is very important that we always keep in mind that we must remain active . And for that, there's nothing better than an Apple Watch and its activity ring system. And is that, although competitors such as the Fitbit Versa appear with their own methods to get you to exercise, few are as interesting as Apple. 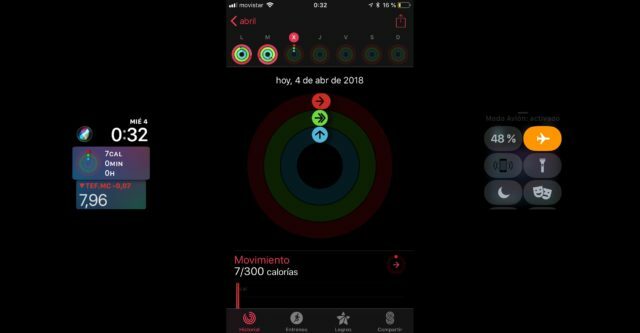 It is not a matter of always being aware that you should exercise, but that you yourself wish to do so in order to see the colorful rings 100%, and that also includes holiday periods , in which many of us get lost. Especially when changing the hours. It is true, however beautiful the Apple Watch is, it will not help you cope better with the changes in the time zone . In fact, no clock is going to help you with that. But if you look forward to continuing to complete them, and do not want the changes to reset your progress, there is a trick that can help you with that. As you know, the time of your iPhone, and of your Apple Watch therefore, is synchronized through the mobile network. For this reason, to avoid skipping during the day and losing all the progress we have made in the rings before changing the time, we can activate the Airplane Mode of the Apple Watch from the Control Center. In this way, our clock will not automatically change the time, and we can finish filling the rings without problem, although we will not be able to access our notifications in the meantime. Now we will have to see if it truly compensates to disconnect to maintain the streak of activity. And you, how do you carry the streak of activity in your Apple Watch?